Sierra Leone Freetown The seven month old girl Josephine Zainab Alli is collected by a Red Cross team in Wellington east of Freetown. 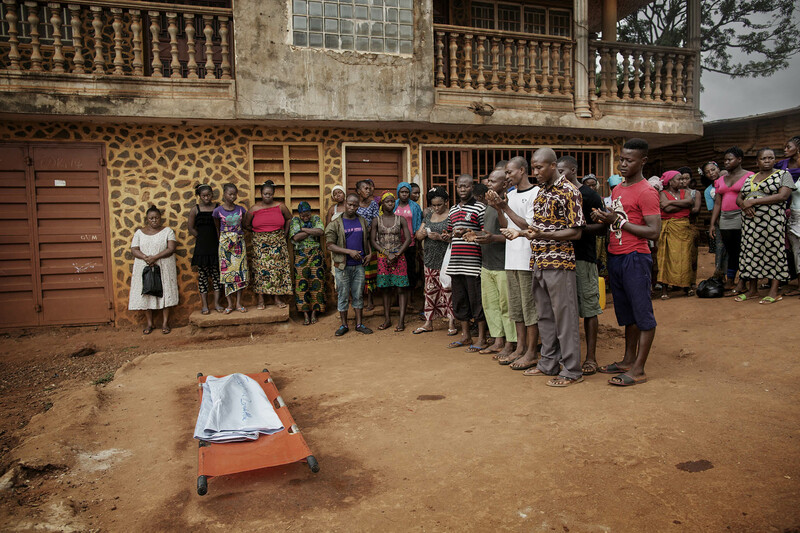 Everyone who dies in Freetown are treated as Ebola victims, for fear of contagion. The family can not say goodbye in the traditional manner, all forms of contact are forbidden. Family and neighbors get a minute where they pray for the baby before the team brings the body to the grave site. Two days later the result from the Ebola test came, she was not infected. The local heros in Sierra Leone have been fighting the Ebola-virus for a year now. Since the outbreak of Ebola in the country in May 2014, more than 100 health workers and 11 of the country's doctors (out of 120 doctors) have died. A total of approximately 3.500 people have died because of the Ebola-virus. The number of cases has been falling steadly, and the daily life is about to return to normal, with fewer restrictions on trade, border-crossing and gatherings.